ArcheWild is now releasing 100% pure American chestnut trees to land managers, nurseries, parks, and committed homeowners. Our chestnuts are the progeny of still-existing stands of American chestnuts that have successfully resisted the chestnut blight (Cryphonectria parasitica). For curation purposes, our chestnuts should be recorded as blight-resistant Castanea dentata, 3rd generation, ‘Lee’ strain. These terms are explained below. 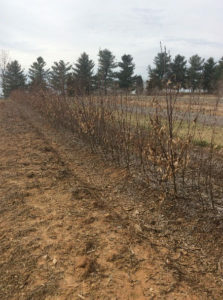 Blight resistance refers to the trees’ ability to survive the chestnut blight to varying levels of degree. 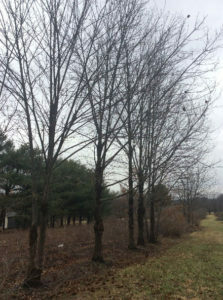 Since these trees are open-pollinated (i.e., not clones), some trees will exhibit more blight resistance and some less. 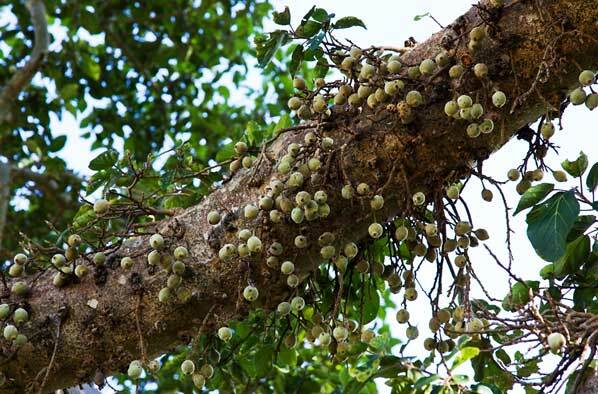 Many of these trees will survive a minimum of 20-30 years and set viable fruit. Some trees are likely to live for much longer; some might die before they reach 15 years old. Because these are real trees with real genes, there is no way to pre-determine how any individual will perform. See Figure 3 to see the 2016 size of our 2nd generation, ‘Lee’ strain mother trees. Castanea dentata is the accepted botanical name for these trees, so as to distinguish them from the Chinese-American cross (Castanea mollissima x dentata) and the other, smaller American chestnut (Castanea pumila), which ArcheWild also grows. 3rd generation means that these chestnuts are the grandchildren of the original, pre-blight Castanea dentata trees. The blight-resistant characteristics of these original trees have been passed, in varying degrees, to their children, or 2nd generation trees, in our orchard. Not all of the 2nd generation trees survived, but only those that survived to seed-bearing age and have good height and structure have been selected (see Figure 3) for producing our 3rd generation trees. ACCF is the acronym for the American Chestnut Cooperators’ Foundation, which is a network of land managers that share seeds and genetic material from still-existing stands of 100% pure American chestnut for breeding purposes. There are two other American chestnut recovery efforts. For more information about the different programs, read the American Chestnut Recovery Efforts section below. ‘Lee’ strain is the reference code used to track performance of various seed lots. 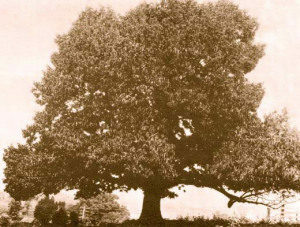 All progeny of our American chestnuts should be recorded as ‘Lee’ strain chestnuts, along with their generation. For example, if you buy our 3rd generation ‘Lee’ strain chestnuts and they survive to seed-bearing age and you plant their nuts to make new trees, they should be recorded as 4th generation, ‘Lee’ strain chestnuts. The American Chestnut Cooperators’ Foundation (ACCF) is dedicated to breeding 100% pure American chestnut strains from the many healthy stands and trees found throughout the region. Although less organized and far less well-funded than ACF, this program is real and producing good results. ArcheWild participates and is currently selling 3rd generation 100% pure American chestnuts, from the ‘Lee’ strain, to botanical gardens and restoration professionals on the East Coast. Trees from this strain get the blight, they all do, but the severity of the infection does not greatly disfigure the tree and generally does not kill the tree. This is the program that, if better organized, should be providing trees to the land managers everywhere. Several universities are investing in probably the best solution to the problem – a genetically modified American chestnut tree that successfully resists the fungus. These trees are not yet ready for the general market, but they should be within a decade or so. Read the article excerpt below describing this research effort. In the meantime, the ACCF chestnuts do not represent a threat to future plantings of GMO chestnuts like the Chinese-crossed ACF chestnuts will most certainly do. “Our efforts focus on direct genetic modification, or genetic engineering, as a way to bring back the American chestnut. 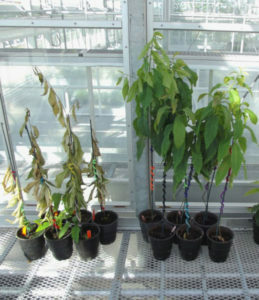 Thirty days after infection with chestnut blight, the wild-type American chestnuts on the left are wilted, while the ‘Darling 54’ transgenic trees are doing well. (See Figure 3). We’ve tested more than 30 genes from different plant species that could potentially enhance blight resistance. To date, a gene from bread wheat has proven most effective at protecting the tree from the fungus-caused blight. This wheat gene produces an enzyme called oxalate oxidase (OxO), which detoxifies the oxalate that the fungus uses to form deadly cankers on the stems. This common defense enzyme is found in all grain crops as well as in bananas, strawberries, peanuts and other familiar foods consumed daily by billions of humans and animals, and it’s unrelated to gluten proteins. Chestnuts currently available from ACF are crossed with Chinese chestnuts and they are, in our opinion, being released prematurely. The original premise was to cross with Chinese chestnuts to pick up the disease resistance genes and then back-cross the Chinese morphological traits back out. This is at least a 100+ year process and ACF is nowhere near completing this program. ACF is aggressively marketing their product so as to get these trees planted so as to head off the future argument that their trees can no longer be planted once the real American chestnuts (ACCF or GMO) reach the market on a large scale. It’ll be easy for ACF to say, “Well, you already planted our (ACF) trees in your forest so the Chinese genes are already there. What’s the big deal if you plant more?” Don’t get suckered into this. Just as ecologists curse the USDA for the spread of Rosa multiflora and the National Wild Turkey Federation for the spread of Russian olive trees, please don’t let future generations curse you or your organization for planting Chinese chestnut genes in our forests. You people do it right..Thanks. Have always perfered this method over backcrossing method. how long will it be before you have 4 th generation plants available? I believe in the ArcheWild program. The use of GMO should be band around the world. There is too much about the Genetic code we do not know and we think that changing a single gene is ok. We have no idea how other genes in the code will react to a single change and what effect that will have on the environment it lives in and what lives on it. Hybridization has been happening naturally for Millennia and by man for Centuries. There is no reason to be overly concerned about cross breeding if you want it. I feel the “Lee” strain is the best option for reforestation of the American Chestnut. I feel that the Chinese/American cross for nut production is a good choice. There is strong evidence that GMO presents severe threat to Native and non-GMO commercial species. Evidence that people are suffering from a number of allergies and sensitivities from eating GMO foods. Even a possible connection to the honey bee die off from the pollen of GMO species. It is time for us to wake up and realize that we do not know enough about genetics to be fooling around with them. We risk too much for ourselves and our future. Richard, GMO always poses some amount of risk and usually above our pay grade to comment on the risk represented by any particular modification. The USDA usually employs a decades-long testing and screening process before certain GMOs or organisms can be released into the wild, which is akin to the FDA-approval process for new drugs. All we can do is hope for a favorable outcome, which is far from guaranteed. Are trees available for Spring 209?